I am super-duper excited to share with you my first (of many!) new downloadable sets of coloring pages for adults! 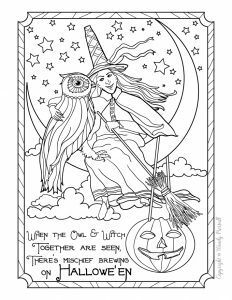 I’ve taken art from rare vintage Halloween cards and re-illustrated them as coloring pages. I’m an über-geek about vintage Halloween collectibles – I have my own collection of books, decorations, cards, candles, and even those cheesy plastic masks from store bought costumes in the 1970’s. So when my dear friend of many years Kelly McCausey launched ColorMonthly.com and asked me to illustrate a premium package for the month of October, turning my passion for vintage into new coloring pages was the first thing I wanted to create. 9/2017: Since this set is now a couple years old, I’ve released these Halloween adult coloring pages for free over on my Woo! Jr. Kids Activities website! 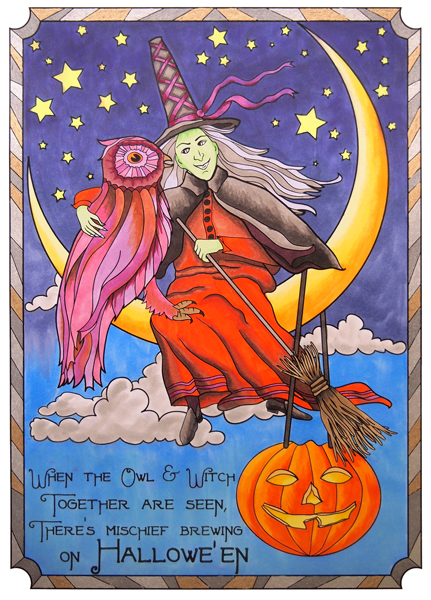 Witch & Owl colored with Copic markers, Pan Pastels, and Sakura Gelly Roll pens. One of my new endeavors is to offer more free coloring samples on this blog – YAY! So here’s the above witch and owl with a jack o’ lantern, free with no strings attached! Here’s another example from the set – this butterfly peacock angel is one of my favorites from the whole collection. She’s so art nouveau! 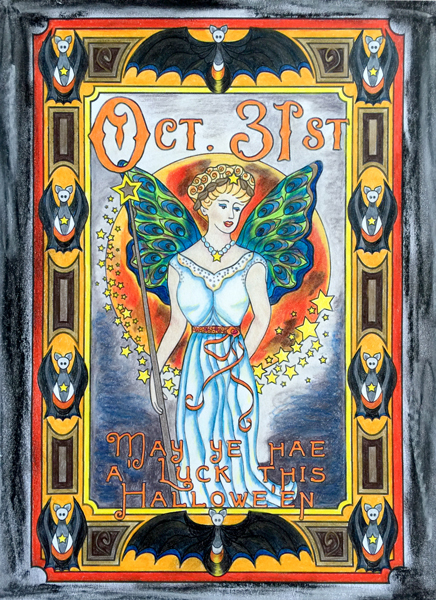 Halloween Angel colored by Lisa Dela Cruz using Prismacolor colored pencils and pastels. Coloring Ocean Mandalas is Here - Preview the Book! Coloring Flower Mandala POSTCARDS are Coming Soon! I am interested in starting coloring groups at the library.